<< Too weak or too strong? Make a conscious decision each morning to please Jesus throughout the day. Life gets distracting, but when our brains hear us direct our activities to the heart of Christ, our desire to please the Lord remains active and alive within us even when we’re not consciously thinking about it. So, before the distractions take over, we have to commit ourselves to a morning prayer time and use that time to ask the Holy Spirit to keep hold of our spirit throughout the day. By connecting our will to God’s will and our spirit to God’s Spirit each morning, we lay important groundwork upon which the day is built. 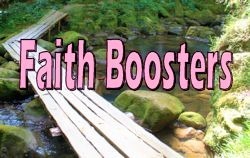 This entry was posted in Faith Boosters on February 22, 2019 by Terry Modica.